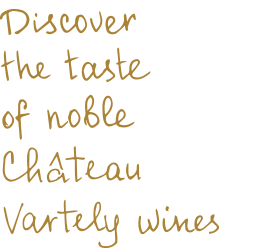 The prominent quality of Château Vartely wines has been recognized through numerous medals and awards received at the most prestigious international competitions. Wines of Château Vartely have received the highest appreciation from both the regular wine lovers and the distinguished experts at Mondial de Bruxelles, Mundus Vini, Vinalies Internationales, Decanter, International Wine & Spirits Competition, La Selezione del Sindaco, Prodexpo, VinoForum and other international wine industry events. Wines crafted at Château Vartely have been awarded with more than 120 medals and diplomas at various international competitions, where they competed with noble wines from France, Portugal, Spain and other major winemaking countries.